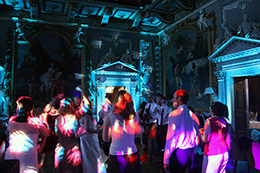 Mood lighting or as it’s often called, uplighting, is an excellent way to transform your venue. Whether its a wedding, party or disco, we can supply mood lighting and uplifting for your venue that will create a virbrant atmosphere that will make your party an event to remember. Sound Division use the latest in LED technology to create this stunning effect. The colour can be set to any of your choice, match the theme of your event or have the colours slowly change thoughout the evening. LED uplighters are cool to the touch and use very little power compared to traditional halogen type uplighters. Book our Mood Lighting for your event, contact us today. We can satisfy the entertainment needs for your event. DJ for Weddings, Parties, Discos, Karaoke, and Corporate Events. Light Shows, Mood Lighting, Uplighters, Laser Light Shows, Mood Lighting, Disco Lighting, Snow Machines, Smoke Machines, Bubble Machines, Video Projectors, Video Screens, Video DJ.